The coordinates are pointing at an interesting vista point in Death Valley -- Zabriskie Point! You can get close to the cache by car. I marked this cache with the attribute "access/parking fee" because there is a fee for entering this National Park. Badlands are regions, rugged by canyons, gulches and gorges, which were developed from erosion. The naming may result from the forbidding ambience, as badlands are very hard to cross or to make them utilizable. Badlands can often be found in arid areas like Death Valley and consist of dry and loose ground like sand. The gorges develop because of the many different materials in the ground with different strength. The materials which can be easily get loose like clay, mudstone and siltstone get washed off relatively fast, while the more solid materials stay. As time goes by, the valleys around solid formations get deeper. 1. Canyons: There are valleys, with staged hillsides. This common type of valley is most of the times eroded by streams or rivers. Sometimes the gorges are dry and only hold water in times of big rainfalls. In this case there are rapid waterstreams running down and taking ground materials with them. 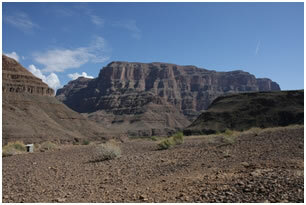 A good example for this kind of erosion (canyon) is the Grand Canyon. 2. Gorges/Ravines: Similar to canyons they are developing through erosion. The difference to the canyons is, that there is more erosion in the down direction, than to the sides. Because of that, gorges have almost vertical walls without steps or stages. A requirement for such structures is, that the sidewalls have to be of strong material. Otherwise the gorge will collapse, if the depth is getting too big. A good example for a gorge is the "Marienschlucht" in Germany. 3. 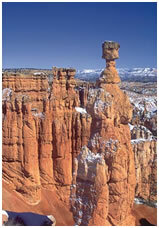 Hoodoos: These are pillars made of rock like spires. They are also made by erosion. They consist of different types of stone with different hardness. In most cases one major component is sandstone. This impressive pillars develop over a long time of wind erosion, while softer structures get washed away and harder stones on top of the spires protect the rest below from further erosion. One of the most known examples for this type of formations are located in Bryce Canyon. Beside the different shapes, in many times you can see a lot of different colors in the formations. This is because of metals within the ground. The traces of different metals oxidize when they get in contact with air and you can see different colors like red, pink or yellow. The history of the Badlands at Zabriskie Point began million years ago. At this time there was a big lake at the position, where you are standing right now. Over a long time sediments like saline muds, gravel and vulcanic ashes were collecting on the ground. Later, borates concentrated in the lakebed because of hot springs bringing the borates to the surface. In the following time, the Area changed because of the rising of mountains in the west and vulcanic activity. As the topology of Death Valley was formed, the climate was getting more arid and dry. The lake was drying up to a dry lake. Further tilting and widening of the Valley formed conditions which made it possible to get the erosions and develop the Badlands we can see today. The above mentioned borates were the reason for establishing mines in 1882. Besides other minerals, borax was mined over serveral decades. 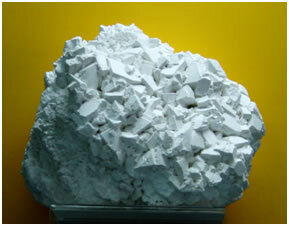 Borax is a mineral, that can be used in many products. Among other things, it is needed for making boric acid, glaze (pottery), flux (soldering, welding), fiberglass, borosilicate glass and in detergents. The Pacific Coast Borax Company was in authority for the operation of the borax mines in Death Valley. The mines were operated since the 1920ies until borax mining activity slowed down. 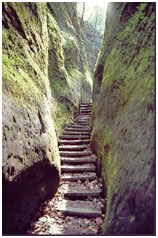 After that time, the valley was declared as a natural monument and later as a national park. Who was Christian Brevoort Zabriskie? In the time from 1885 to 1933, Christian Brevoort Zabriskie the man, this place is named after, was connected close to Death Valley. 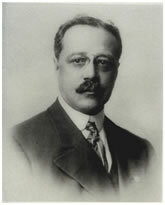 In the beginning he supervised the hundreds of Chinese workers in the borax mines and went up to be the vice president and general Manager of the Pacific Coast Borax Company. In the end of borax mining he overlooked the progress of changing Death Valley from a mining site to a natural monument and tourist attraction. To log this cache, you have to send me the correct answers to the questions Number 1 to 4 Question Number 5 is only a bonus question and not a log requirement. Please send the answers to my account email address and DON'T put them into your log. I will delete every log, with answers in it! You can log this Earthcache right after sending the answers to me. You don't have to wait for a log permission. I will contact you after checking your answers and will send more and correct information, if there was something wrong. 1. Take a look at the Badlands and their appearance. Which of the above described geomorphologic forms (canyon, gorge/ravine or hoodoo) matches best to the scenery in front of you? 2. As the borax mining slowed down in Death Valley, the focus of the Pacific Coast Borax Company changed. One step is described on one of the information boards at the cache coordinates. What is the name of the "elegant" real estate, that was build here and when was it opening? 3. On a second information board you can find interesting facts about borax mining. Tell me, what two forms of Borates were found in the lakebed deposits of Furnace Creek? 4. 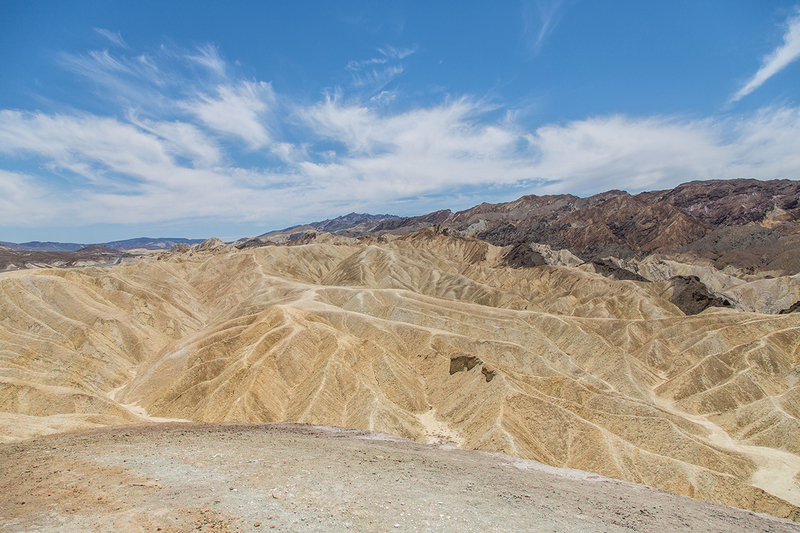 To experience the Badlands more intensive, you can take a hike through the Landscape around Zabriskie Point. Right at the parking area you will find another information board that tells you more about some trails. On this Board there is only one round trip mentioned. What is the name of this trail and how long is this round trip? 5. As for my personal statistical purposes please post the actual temperature and the Weather conditions (e.g. cloudy, rain...) at Zabriskie Point in your log. As some cachers may not have a thermometer with them, this is only a bonus question and not a logging requirement.